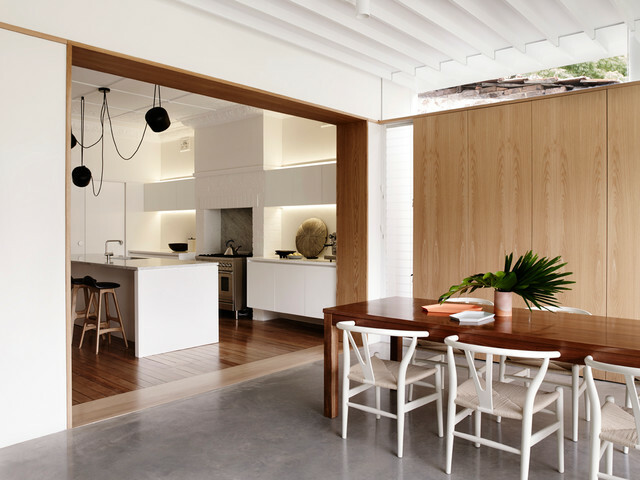 Here, as in most homes, the kitchen is the hub for this family, and the rest of the house is connected to this central open-plan space – all ground floor rooms open onto this area. “The kitchen is located where the original living room used to be and the oven is in the original fireplace,” says Hudson. The open-plan design gives the couple’s young children plenty of room to play, while still being in plain view from the kitchen and living area. Wood stain table with white simple chairs.